Hello! Hannah here. 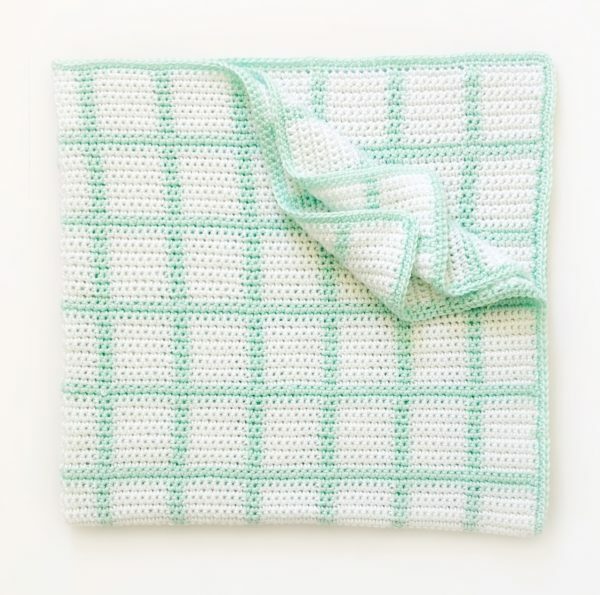 Ever since my mom started making gingham blankets, I’ve been wanting to make this crochet windowpane baby blanket, but I wasn’t sure if I was a good enough crocheter to handle the technique of carrying the yarn. But when I did a few sample swatches to experiment with colors I realized that it really wasn’t as difficult as I thought it was, and that this windowpane design is actually a great way to practice for real gingham blankets because you only have to use two colors instead of three! On the surface, carrying the yarn for the green stripes may seem like a waste of extra yarn, but if you think about the amount of ends that you would have to weave in, I don’t think carrying through takes up that much more, especially if you are using a relatively lightweight yarn. I think carrying yarn was the best way to do it for the look I was going for and I really love how it turned out. When I first started doing some practice swatches for this blanket, I wanted to make the lines electric blue, but the blue being carried through just stuck out too much, so I decided to go with a lighter color that would blend in more with the white. And actually I’m so glad I did because I’ve been seeing this minty green color all over the baby section at Target lately and I think it could go for either a girl or a boy! Chain 129 in white with a size G hook. (Or one size smaller than whatever you are using. If you saw in the video, starting with a smaller hook helps to keep the chain from sagging). If you want to make the blanket bigger or smaller, the pattern repeat is any multiple of 10, plus 9. Switch to an H hook and *[work 8 SC in white, pulling through with green on 8th stitch. Work 2 SC in green, carrying the white yarn behind, and pull through with white on the second stitch. ]* Repeat *[ ]* until end of row, always carrying the yarn that you aren’t using. You should have 8 stitches of white at the end of the row. Chain one, turn and repeat *[ ]* for 10 rows. On the last white stitch of the 10th row, pull through with green. Chain one and work two rows of SC in green, carrying the white yarn behind. On the last green stitch of the second row, pull through with white and repeat *[ ]* for ten rows, then two rows of green, etc. until you reach your desired length. To make sure you don’t get crooked lines, if you are going back to check your work you should always have 8 stitches of white followed by two stitches of green. When I reached the last ten rows of white, I worked one row of SC of green and continued around the blanket to form the border on the sides and the other end, working 3 SC’s into the corners. I worked another row of green SC around the edges so that I had 2 total, and when I reached the corner I started with, I slip stitched into the corner and tied off the blanket. Thanks so much for stopping in for this pattern! Once you finish your project we’d love if you would take a picture and share with us on Instagram! Just use the hashtag #daisyfarmcrafts on your photo – we’d love to see your creativity. I think this blanket could look cool with a lot of different lighter colors that blend in with the white when you carry the yarn. If you’ve been following the farm for a while, you know that one of the reasons that my mom and I like to crochet baby blankets is that my husband and I have been struggling with infertility for the last several years and we hope that one day one of these blankets will welcome a new baby into our family. We like to joke that this baby must have a very specific style because we apparently haven’t made the right blanket yet! Every month that goes by tends to bring a rollercoaster of emotions for me, but I’m grateful to have these crochet projects to allow me to be creative and to have a way to physically show my hope for the future. So far a lot of the blankets that we’ve made have ended up going to babies that have come to our friends and family and its fun to be able to celebrate with them and welcome those babies into the world. I’ve only been crocheting for about a year, but it’s been interesting to look back and see how I’ve improved my crochet over the last year. There is something really comforting in the idea that things can be learned, that we can become good at things we were bad at before. In this phase of life right now I’m still trying to figure out my purpose and how I can have a fulfilling life without kids and I’m grateful that life is a lot like crafting in that I can just keep trying new things, trying to be creative and learning from my mistakes. And hopefully down the road I’ll eventually get to look back and be able to appreciate how I’ve grown.